Two more Van Wert County student athletes signed letters of intent Wednesday to continue their academic and athletic careers at the collegiate level. 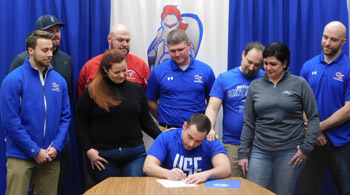 Crestview’s Micah Snyder will play football at the University of St. Francis, while Van Wert’s Hayden Maples will play baseball at Ancilla College. A key contributor to Crestview’s football program on offense and defense, the 6-0, 225 senior is projected to play defensive end for the NAIA runner up USF Cougars. Snyder, the son of Carey and Julie Snyder and Allene Schwartz, was a mainstay along Crestview’s offensive line and recorded 21 tackles and a pair of sacks on defense during the 2018 season. “Micah’s always earned his stripes,” Crestview head coach Jared Owens said. “He was a little bit of a late bloomer and he worked his tail off in the weight room, so from that perspective he’s developed a work ethic that will allow him to be successful because he knows what it takes. Snyder is undecided on a major, but said he may wind up in business. 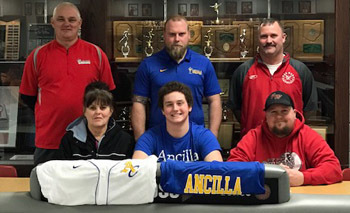 Van Wert senior Hayden Maples, the son of Ivan and Shelly Maples, is officially committed to the Ancilla College Chargers, a two year school near Donaldson, Indiana. During his junior season, Maples hit a school record .495 with 34 hits, and finished with a team leading 21 RBI and 15 runs scored. On the mound, he pitched 27 innings and finished 3-2 with an ERA of 1.30, 16 walks and 22 strikeouts. Maples was named First Team All-WBL and First Team All Northwest District as a catcher. “Position wise I’m looking to be a catcher or pitcher but I am willing to play wherever they may need me,” Maples said. Van Wert baseball coach Charlie Witten believes the Chargers have landed a good one in Maples. Maples is the fifth member of the 2019 Van Wert High School baseball team to sign on to play college ball. Lawson Blackmore will play at Miami (OH), while Jaxson Amweg, Jalen McCracken and Nathan Temple will play for St. Francis.